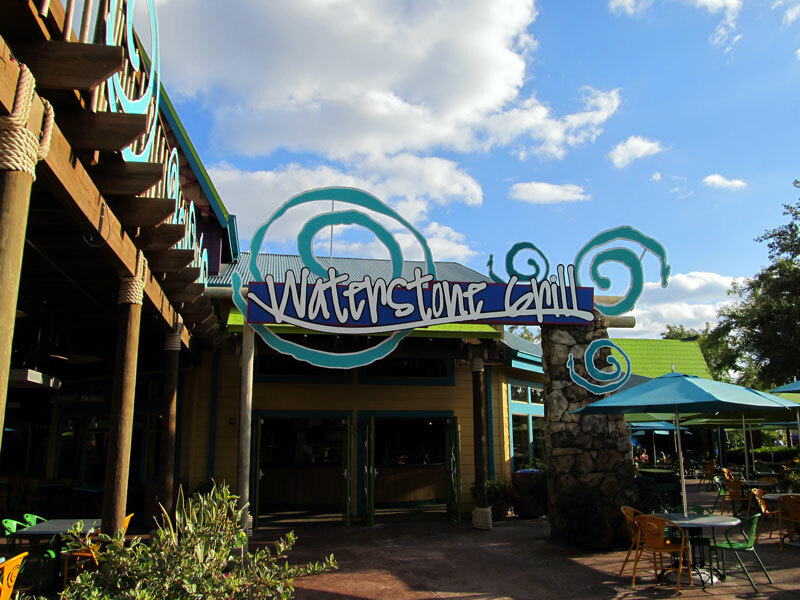 Since this was Sea World, I figured I had to get Waterstone's Fish Sandwich. The sandwich consisted of fried fish, lettuce, and tomato on a slightly sweet roll. French fries were served on the side. The sandwich tasted good, although the fries were cold. Only real quirk was with the size of the fish. When you enter the restaurant, they have all of their menu offerings on display. The fish sandwich behind the glass had a piece of fish about double the size of the fish I received. Regardless, my sandwich was still plenty to eat. East Buffet opened in a former Roadhouse Grill in Longwood. The main buffet area is in the center of the restaurant. There's a hibachi grill in the former open kitchen of Roadhouse and a sushi bar was set up towards the back of the restaurant where all the sushi was made for the buffet. 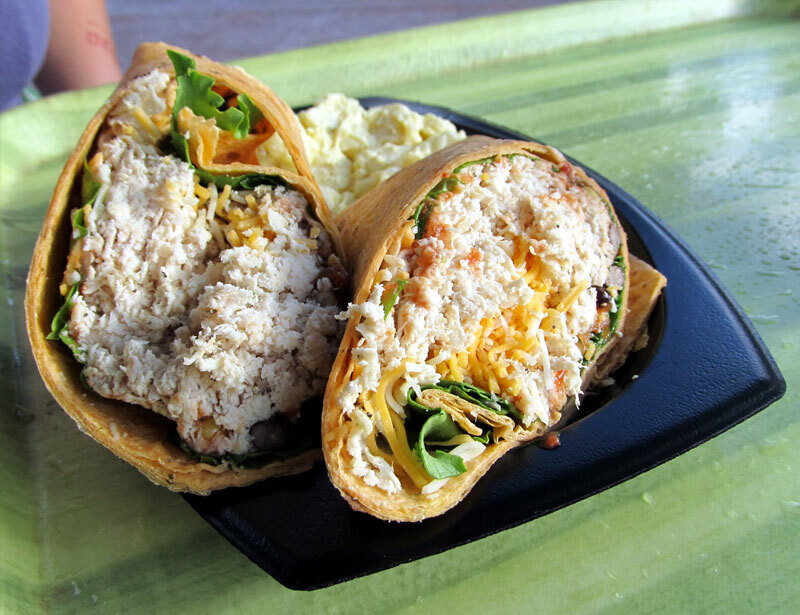 I ordered their burrito off the raw section of the menu. This burrito was filled with avocado, tomato, onions, and something that resembled a meat-free version of ground beef. It was all wrapped in a romaine lettuce leaf and topped with a vegan creamy sauce and fake parmesan cheese. On my visit, we ordered the Citrus Grilled Chicken family meal. This came with four 1/4 pieces of chicken (basically a whole chicken) and a large side of black beans & rice. Also included were several corn tortillas. I liked the food here. The chicken had plenty of flavor, as did everything else I tasted. Pretty good for fast food! When the recent Orlando Weekly article on the Vietnamese sandwiches called banh mi was published, I decided it had been far too long since I had eaten any sort of Vietnamese food. 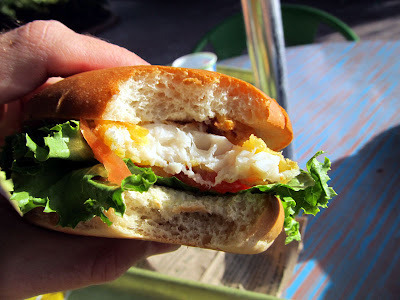 The next thing I knew, I found myself at Banh Mi Nha Trang in Orlando's Mills-50 District. The banh mi is this restaurant's specialty. For $2.50, you get a large sandwich that's ingeniously packaged. 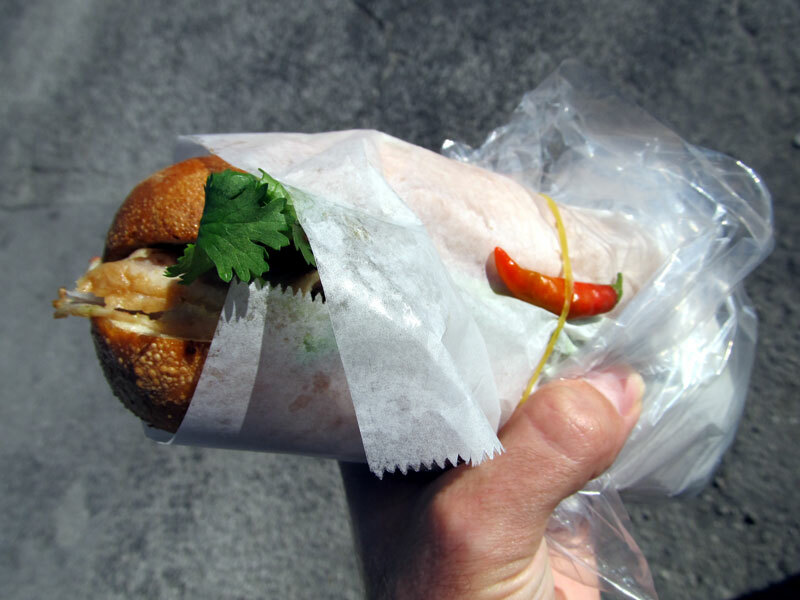 With it's paper and plastic bag secured with a rubber band (and pepper), it keeps the banh mi held together while collecting any juices that might drip out. All sandwiches should be packed like this. The banh mi came on a toasted baguette with a very nice crust. 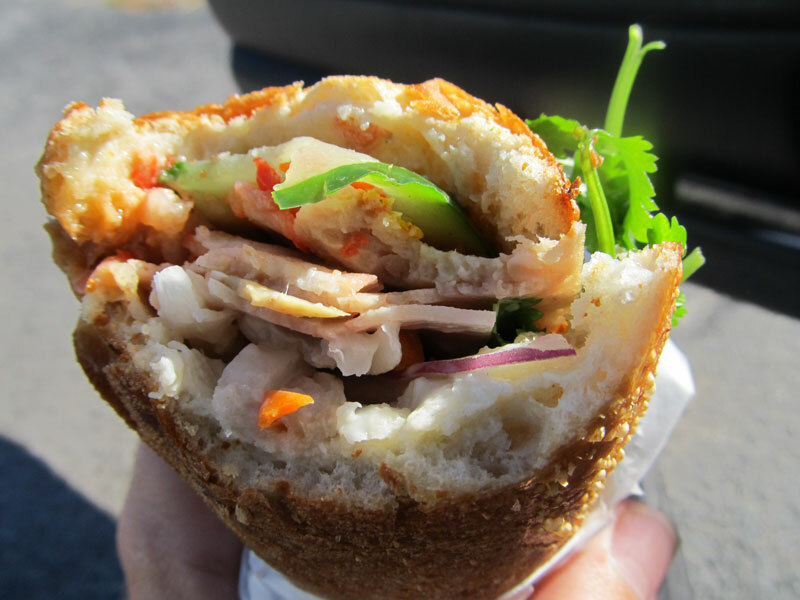 Roast pork, cucumber, cilantro, onions, various pickled vegetables, mayonnaise, and fish sauce filled the sandwich. There was potentially a few more banh mi fillings that I couldn't quite identify, and I'm not going to try. All I know is that this was a delicious sandwich! I already put up lots of fancy food pictures from the Great Gatsby Dining Room aboard the Royal Caribbean Grandeur of the Seas from last August. 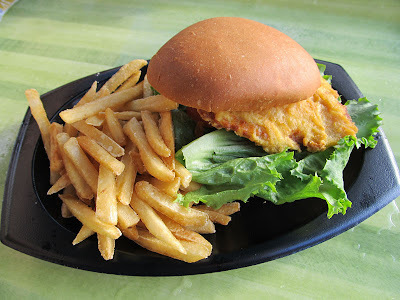 Since I have pictures of more cruise food aboard the ship, I figured why not do another post on it! The ship had a buffet called The Windjammer. I enjoyed the breakfasts here. You can't go wrong with a buffet with smoked salmon on it. Lunch and dinner here wasn't as good. Except for the day when they had all sorts of Asian foods, the majority of the food was mediocre. Many times, they served variations of what was being served in the dining room without the fancy presentation. Back in August, I went on a cruise on the Royal Caribbean Grandeur of the Seas. The trip provided some opportunities for short food adventures in Key West and Cozumel, but let's not forget the food on the ship. The Great Gatsby Dining Room was the main restaurant on the boat and I enjoyed the food here for the most part. Some dishes were really good, others not so much. For mass produced meals feeding about 1,000 people at a time, overall I thought the food was pretty good. My main course was a Potato and Cauliflower Curry, served with rice, roti, and a yogurt sauce. I wasn't expecting Indian food on a cruise ship, and it was really tasty! They had a variation on this dish every night as a vegetarian option. I also had a bowl of Oxtail Soup. Day 3 Dinner: Roasted Garlic Soup came first. I also had Scallop Risotto for an appetizer. Very tasty with huge scallops. The Garlic Tiger Shrimp were served over rice with assorted vegetables. Day 4 Breakfast: The forth day of the cruise was the boring day at sea where there's no stopping in any port, so the entire day pretty much consists of moving from restaurant to restaurant to fill time. I ate breakfast in the Great Gatsby Dining Room rather than the buffet for the first time on the trip. Luckily, I was traveling with a large enough group to fill up a whole table in the restaurant for dinner. Because of this, the awkwardness of being seated with other random people on the ship was avoided for the most part, with the exception of this meal. I had the Smoked Salmon Benedict. Lox and runny eggs were served on an English muffin, topped with hollandaise sauce and asparagus. Hash browns were served on the side. Day 4 Lunch: I also did lunch in the Great Gatsby Dining Room. They had a very nice salad bar set up where you selected your ingredients and a chef tossed the salad. I ended up with lots of fresh mozzarella and thinly sliced prosciutto in my salad. They had a Greek Salad on the menu topped with Octopus salad. It sounded good, so I ordered a side of the marinated octopus. A little chewy, but still tasty. And here's a lamb sandwich. Tasted just like pulled pork on a pita to me. a slice of Key Lime Pie for dessert.